Enter your email to receive FREE instant notifications when Uptime Robot goes down. February 28, 2019 15:57 UTC DOWN 2 minutes Affected services: API, Blog, Monitoring Engine, and Website. February 28, 2019 15:47 UTC DOWN 4 minutes Affected services: API, Blog, Monitoring Engine, and Website. February 28, 2019 07:20 UTC DOWN 2 minutes Affected services: API, Blog, Monitoring Engine, and Website. February 28, 2019 06:02 UTC DOWN 2 minutes Affected services: API, Blog, Monitoring Engine, and Website. February 22, 2019 01:15 UTC DOWN 5 minutes Affected services: Blog. 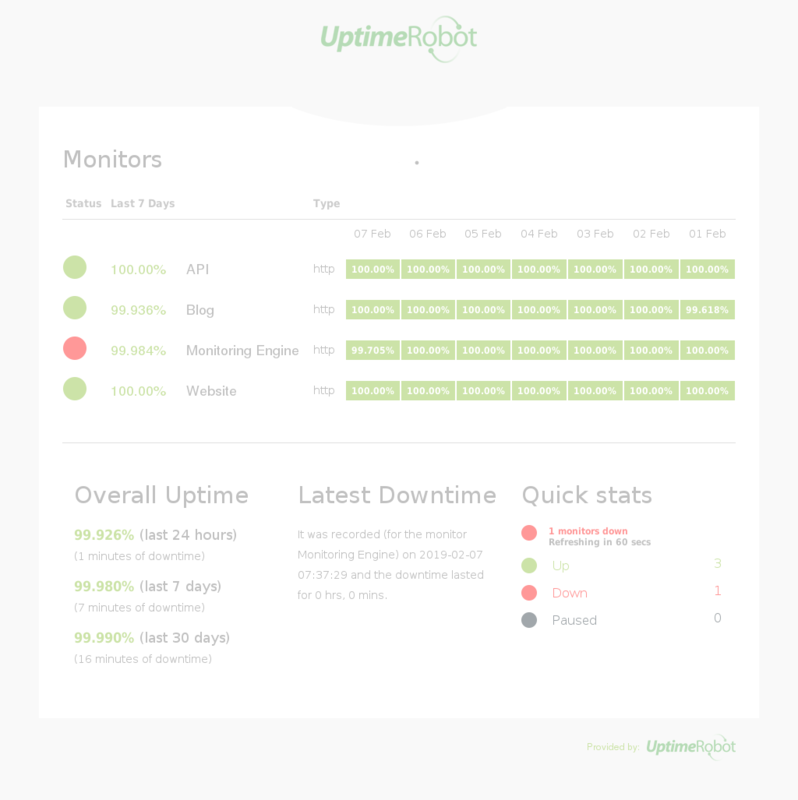 February 15, 2019 13:39 UTC DOWN 4 minutes Affected services: API, Blog, Monitoring Engine, and Website. February 14, 2019 13:14 UTC DOWN 4 minutes Affected services: API, Blog, Monitoring Engine, and Website. February 09, 2019 02:02 UTC DOWN 10 minutes Affected services: Blog. February 08, 2019 04:37 UTC DOWN about 4 hours Affected services: API. February 07, 2019 12:37 UTC DOWN 4 minutes Affected services: Monitoring Engine.